The fact that we've kept the number of U.S. states relatively static is nothing short a miracle—there have been hundreds of attempts at state secession over the years. But what if they had all succeeded? 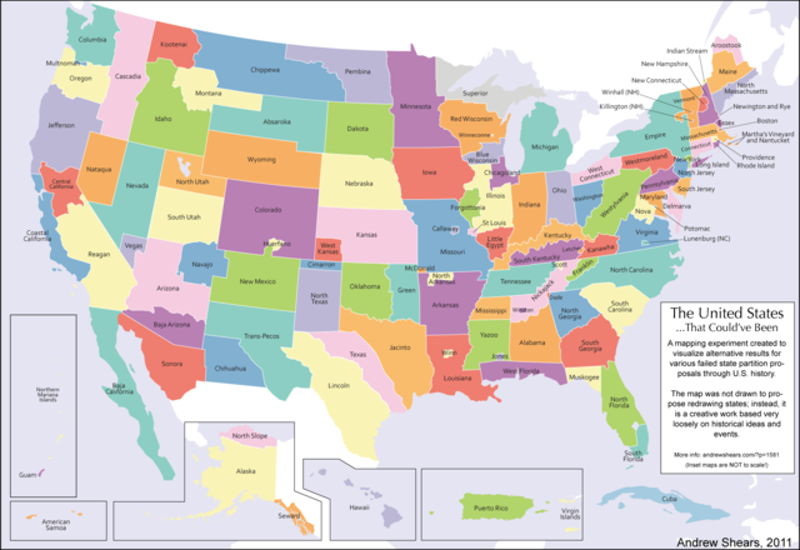 This brilliant map depicts that alternative universe, where the U.S. is broken up into 124 different states that stretch from sea-to-shining-sea. Most of my life, I've daydreamed about history — not so much the incredible depth of historical events that have already occurred, good thinking as that might be. No, I've constantly fictionalized history by changing the outcome of one event here and there and exploring the possibilities of what would have come next. Sometimes I come up with some utterly ridiculous progressions on these alternate timelines of whole new worlds based on relatively minor changes. Shears' map shows each and every attempt at secession along with the boundaries these movements intended to set up, including Independent Long Island, which would've severed it from New York, and South Florida, which would've protected Miami from the rest of the state (smart move). Then there are those that partially, or temporarily, saw success: Like the State of Franklin, which existed for four and a half years before collapsing in 1789.